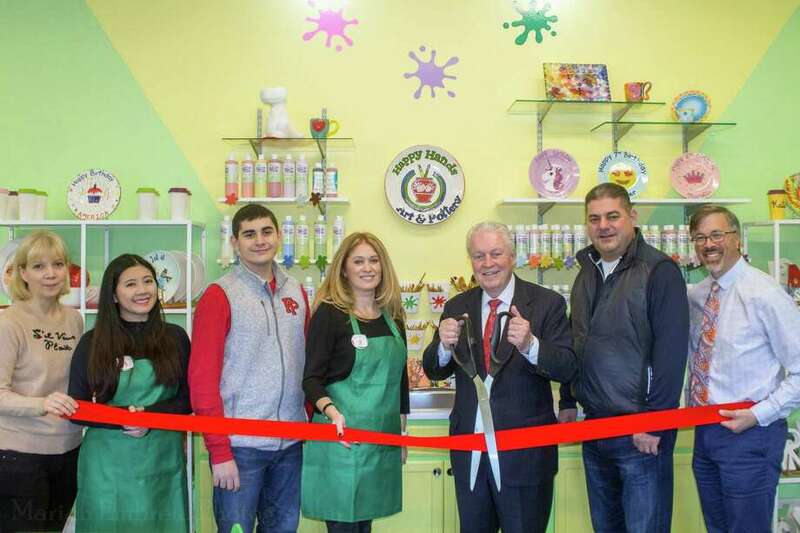 From left, Alina Dancho, Janice Eng, Matthew Ionescu, owner Alla Ionescu, First Selectman Mike Tetreau, owner Bob Ionescu, and Fairfield Community and Economic Development Director Mark Barnhart celebrate the opening of Happy Hands Art & Pottery on Oct. 26 in Fairfield. The Fairfield County Arts Association will meet Nov. 15 at 7 p.m. in the Roger Ludlowe Middle School Team Room 292, Fairfield. The featured presenter will be Christa Forrest, a Stamford artist specializing in pastel, oil, acrylic and mixed media art. She will discuss and show her recent shift to figurative painting and her “Goddess” series of empowering women. After spending 20 years in a finance career, she decided to follow her true passion and become a full-time artist. Her work has been exhibited throughout New York and Connecticut. She recently began creating a detailed and expressive “Goddess” series, where she incorporates the divine feminine and illustrates the strength many women struggle to connect with in their daily lives. “The Emerging Goddess” presents an edgy, modern presentation of figurative art promoting the female as a powerful figure. Nonmembers are welcome to attend. For information, visit www.fairfieldcountyartists.com or call Alice Katz at 203-259-8026. The Fairfield Chamber of Commerce and Brooklawn Country Club will host its November Business After Hours on Nov. 15 from 5:30 to 7 p.m. at 500 Algonquin Road, Fairfield. Attendees will enjoy complimentary wine, beer and/or soft drinks, plus taste delicious light bites and appetizers. The Chamber’s Business after Hours event is an informal, after-work gathering for Chamber members, guests and prospective members. It is an opportunity to network with other business associates and colleagues, exchange ideas, obtain business leads and make professional referrals and friends. During the evening, guests will enjoy lively discussions, idea sharing and dynamic conversations with colleagues, Chamber members and their guests. Attendees will also have the opportunity to tour the Brooklawn Country Club and meet the general manager, Kevin Lalumiere. Tickets are $10 for Chamber members, $25 for nonmembers, and $5 extra for walk-ins. For ticket reservations or information on this event, call the Fairfield Chamber of Commerce at 203-255-1011 or register at www. FairfieldCTChamber.com. The Fairfield Department of Community and Economic Development recently announced the opening of Happy Hands Art & Pottery, which celebrated the official opening of its location in Fairfield with a ribbon cutting ceremony on Oct. 26. The business is located at 85 Mill Plain Road, within the Fairfield Sportsplex. Fairfield First Selectman Mike Tetreau and Economic Development Director Mark Barnhart were among the dignitaries and other guests on hand to help owner Alla Ionescu mark the occasion. The Fairfield studio is the third location for Happy Hands, which has similar facilities in Wilton and Shelton. Happy Hands Art & Pottery is a paint-your-own pottery and clay studio in which people of all ages can create their own masterpieces. The studio offers a wide variety of programs ranging from birthday parties, after school programs to ladies nights and fundraisers. For hours and information about the studio, visit www.hhpottery.com or their Facebook page, www.facebook.com/hhpottery . The town of Fairfield has earned top honors as a “Sustainable CT” community under a new statewide program that recognizes Connecticut’s most thriving and resilient municipalities. The Sustainable CT initiative, which awards certifications to Connecticut communities that voluntarily meet high standards in a broad range of sustainability accomplishments, was launched last year and announced its first group of certified towns in early October. Fairfield is one of just five towns statewide to receive a Silver certification, the program’s highest designation. The other Silver-certified municipalities are Glastonbury, Greenwich, Hartford and Stamford. Seventeen other Connecticut communities received the next highest designation, Bronze. Additionally, Fairfield earned another high distinction: With towns achieving their certification on the basis of points awarded for specific sustainability actions, Fairfield’s record of activities garnered more points than any other community in the state. Many of Fairfield’s ongoing and planned sustainability projects are reflected in the town’s master Sustainability Plan, now under development, which details specific initiatives for safeguarding Fairfield’s natural and built environments, natural resources, and quality of life. Residents are invited to attend an upcoming public forum on the Sustainability Plan, on Nov. 10 at 10 a.m. at the Pequot Library, 720 Pequot Ave.
Fairfield residents Michael Cullinan and William Lopata graduated from Saint Anselm College on May 20. Gabrielle Alessi and Megan Hines, of Fairfield, graduated this year from Marquette University in Wisconsin.